We are thrilled to see innovative (and all) companies use Flow Kiosk as their trade show kiosk app. When Dolby reached out to us over the summer, we jumped at the opportunity to count them as a customer. They had some questions on how to integrate and make her PDF presentation become a secure, interactive kiosk presentation. We showed them how to import a PDF and then recreate the navigation that was lost in the “PDF to Flow conversion” process. The process is straightforward and only takes a few minutes to complete. Your Flow will essentially be full page images taken from the PDF. You then ‘layer’ on new images, videos and links to make the PDF a Flow aka an interactive presentation. Create rectangle shapes, change the color and make it 0% opacity so it’s transparent and place on top of the words or images that you want to work as buttons. Dolby’s biggest priorities for their trade show kiosk were the content and application looking great and working well and it being secure. With kiosk mode married to the iPad’s Guided Access single app feature, Flow Kiosk was the right trade show kiosk app solution for Dolby. The Dolby creative team continued to iterate on the content of their presentation up until just before the trade show. When the final version was delivered to Dolby as a PDF, she went through the process above, adding the interactive navigation. Then, without the need of additional IT resources, she updated the several iPads with the latest presentation and had a successful show. 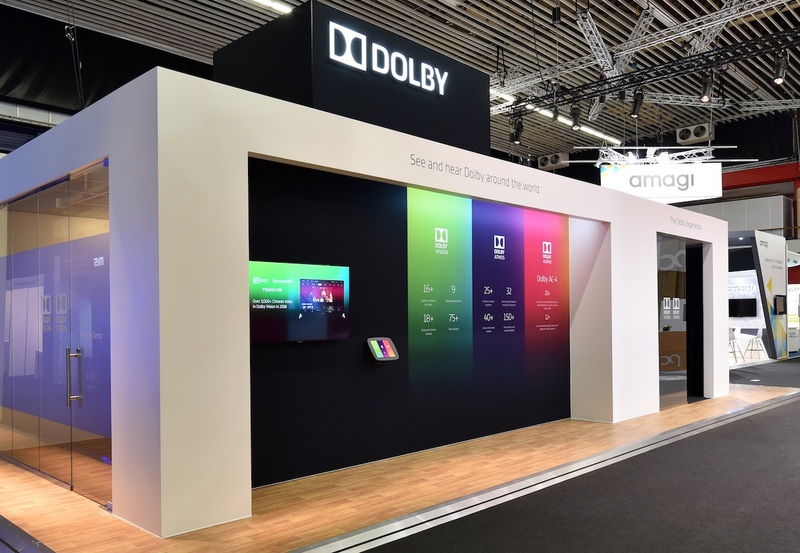 We reached out to Dolby while she was at the show and she reported back that all was working well, and sent us the photos you see here. And here is a short 3 screen Flow with a couple additional photos. Our presentation worked flawlessly throughout the 5-day long trade show and it never once glitched. Many tried to pinch and expand their way out it, but Flow Kiosk locked the presentation in place. Making onsite changes and adding automation was a breeze and upload times were fast, even with low bandwidths on trade show floors. We’re looking forward to using Flow Kiosk for our upcoming shows and events! Note – This post was updated per feedback from Dolby. We can’t to work further with them in the future!